Our gift cards can be redeemed at any of our US participating locations, including Puerto Rico and Guam. Please visit us at www.ColdStoneCreamery.com for more information and store locations. Our gift card is ideal for birthdays, holidays, employee incentives and more! 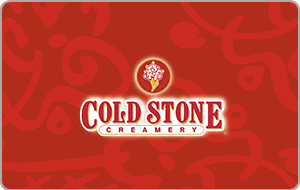 Cold Stone® Gift Card (Card): Issued by KGC, L.L.C. Use of this Card constitutes acceptance of the following terms: Until activated, Card has no value and cannot be redeemed. Once activated, protect and treat this Card as you would cash. KGC, L.L.C. is not responsible for unauthorized use. Lost, stolen or damaged cards may only be replaced for the remaining value with original proof of purchase, including card identification number. Balance not transferable to another card. Card may be used for purchases only at participating U.S. Cold Stone stores. Balance remaining on Card is not refundable or redeemable for cash and cannot be applied to a credit card, except where required by law. Card carries no expiration date, processing, service charge, dormancy or administrative fees. Subject to state and federal laws and regulations, which vary by jurisdiction and change from time to time. Therefore, terms and conditions affecting this Card are subject to change without notice. Void where prohibited. Not for resale. Not a credit or debit card. Card not reloadable. For balance inquiry, terms and conditions and participating locations, please visit your local Cold Stone store or log onto www.coldstonecreamery.com. © 2014 KGC, L.L.C. Cold Stone, Cold Stone Creamery and the medallion design are registered trademarks of Kahala Franchising, L.L.C.